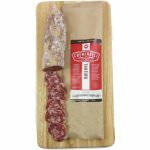 Fra' Mani's mission is crafting salumi in the finest Italian pastoral traditions, using the highest-quality pork. The pork comes from family farmers committed to the well-being of their animals and their land. The hogs are never given antibiotics, artificial growth hormones, growth-promoting agents or meat by-products. They eat only the finest grains and natural feed. This old-fashioned way to raise hogs produces pork of outstanding quality, which is the essential ingredient in all Fra' Mani salumi. 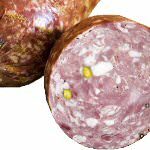 Mold is beneficial in the aging process of salame. 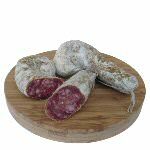 Fra' Manis Salametto has both white mold (penicillin nalviogense and blue/green mold (penicillin glaucum). Both are harmless strains, similar to the mold found on cheese. Depending on the storage conditions, mold may change in color and increase or decrease in quantity. 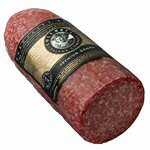 Changes in the mold alone do not affect the quality of the salami itself. 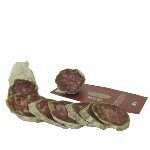 The handcrafted Salametto is coarse ground and garlic scented. The sausage is rich in color and full in flavor. Great for picnics! Ingredients: Pork, sea salt, wine, garlic, dextrose, natural flavor, spices, starter culture.